Why are Prerequisites Important in Technical Diver Training? Prerequisites can be found in the Standards and Procedures for any course you are interested in taking. https://www.tdisdi.com/wp-content/uploads/2016/05/The-importance-of-course-prerequisites2.jpg 500 833 jamescouncill https://www.tdisdi.com/wp-content/uploads/2015/07/logo2.png jamescouncill2016-05-10 14:54:362017-10-23 12:48:32Why are Prerequisites Important in Technical Diver Training? Just How Simple are Rebreathers? Because of your responses, we felt it important to put our previous article into context. https://www.tdisdi.com/wp-content/uploads/2016/03/SFW_Myths2.jpg 540 900 jamescouncill https://www.tdisdi.com/wp-content/uploads/2015/07/logo2.png jamescouncill2016-03-09 10:29:192017-10-23 12:51:32Just How Simple are Rebreathers? Is CCR Diving Right for You? Fortunately, there is a way you can discover whether CCR diving may be for you without ever having to make that investment. It’s called the TDI Rebreather Discovery experience. https://www.tdisdi.com/wp-content/uploads/2015/09/Ready-for-a-rebreathe.jpg 600 1000 jamescouncill https://www.tdisdi.com/wp-content/uploads/2015/07/logo2.png jamescouncill2015-09-09 10:01:292017-03-30 11:14:35Is CCR Diving Right for You? This article could have dealt with Boyle’s law, partial pressures, oxygen toxicity, and how rebreathers work. Unfortunately, it would be three times as long and could (probably would) prove to be boring. Therefore, I chose a more direct approach. I have designed a single day of recreational diving and compared the experience of three divers equipped with different scuba devices ranging from a common open circuit aluminum 80 ft3 tank using air, an identical tank but one equipped with 32% nitrox, and finally the recently introduced Hollis Explorer semi-closed rebreather. The day’s diving takes place from a boat that is positioned in an area with a wide variety of depths ranging from walls with maximum depths over 30 metres / 100 feet to reefs as shallow as 18 metres / 60 feet. The Captain of the boat has decided there are to be three no-decompression (NoD) dives separated by two hour surface intervals and are to include a mandatory safety stop of five minutes at 3 metres / 10 feet. He also insists that the divers surface with no less than 35 BAR / 500PSI in their tanks. This boat does not have a compressor, and it follows that all of divers must bring the tanks necessary for the three dives. The first dive is a multi-level dive beginning at 30 metres / 100 feet followed by a 15 metres / 50 feet second depth option. The second dive is also a multi-level dive to a maximum depth of 24 metres / 80 feet with a 12 metres / 40 feet second depth option. The third dive is to be at a single depth of 18 metres / 60 feet. In order to be able to visit the three sites that the Captain has chosen in the time allotted, he insists that for the first two dives the divers not exceed a 60 minute bottom time. Bob, by far the oldest of the three, carries on board three aluminum 80 ft3 tanks filled with air (21% oxygen). He has been diving for over 40 years, and he has developed the particularly low value of air consumption (SAC of 0.5 cu ft/min)2. Mike has three new aluminum 80 ft3 tanks that are prefilled with 32% enriched air mix and sport Nitrox labels. Ordinarily he has a considerably higher SAC, but for this exercise we have made his the same as Bob in order that we can see what Nitrox brings to the table. Nick, by far the youngest, has a brand new Hollis Explorer semi-closed rebreather that is equipped with a steel 28 ft3 tank filled with a 40% nitrox mix, and he too has two backup tanks similarly filled with 40% nitrox. Nick has a SAC of 0.75 cu ft/min, which represents a more common value among recreational divers. All of the divers are equipped with dive computers, and with one exception, all have been programmed to reflect a predetermined value of oxygen content. The exception is Nick’s Explorer that has been designed to optimize the dive time by choosing a value of the oxygen fraction in the breathing gas such that the no-decompression limit (NDL) equals the capacity of the device. This of course is subject to the maximum operating depth (MOD) dictated by an accepted value of PO2 = 1.4 atm. In addition, the dive time based on the canister life of the Explorer is limited to 120 min. The results of the first dive are shown in Table 1, where TBT refers to the total bottom time. The dive times that were controlled by NoD limits are labeled as ND, by scuba capacity as CAP, and 60 for the Captain maximum specified bottom time. As can be seen, Bob, the traditional open circuit air diver, was seriously disadvantaged at the first depth of 30 metres / 100 feet where the other two divers have significantly greater bottom times. Note that if Nick with a more common SAC had been using the open circuit rig, his TBT would have been less than 30 min. After a 120 minute surface interval, the Captain has moved the boat to a new dive site where the maximum depth is 24 metres / 80 feet. Again Bob is at a disadvantage at the first stop. However, it is interesting to note that Mike who gained eight minutes over Bob at the greatest depth, lost five minutes in total bottom time. Nick with the Explorer greatly surpasses both Bob and Mike at the first depth even with the imposed 60 minute TBT. Finally the boat is anchored above a reef that has a constant 18 metres / 60 feet depth, and the Captain has told the divers that they no longer need to adhere to the maximum 60 min bottom time. All of our divers have switched to their clean tanks, and Nick has renewed the Explorer’s canister absorbent. The result is that with no constraint on bottom time, as can be seen in Table 3, Nick has more than twice the bottom time with the Explorer over the open circuit divers. We don’t see dramatic differences during the first two dives largely because of the boats 60 min bottom time limit. However, Mike by using Nitrox has had more time at the greatest depth as well as Nick using the Explorer. It is worth remembering that Nick has an average diver’s SAC of 0.75 cu ft/min whereas Bob, the elder, and Mike by caveat was granted the same low SAC rate of 0.5 cu ft/min. Finally, on the third dive where the Captain removed the 60 min bottom time cap, the Explorer had more than twice the bottom time as the open circuit divers. It is worth noting that while the Hollis Explorer is semi-closed, during the entirety of these dives the exhaled gas never reached 10% of that of the open circuit divers. Based on this example, the Hollis Explorer rebreather has a significant advantage over open circuit divers even those with exceptional breathing control that is 2/3 the SAC of the average diver such as Nick. The Hollis Explorer is not accurately characterized as “no bubbles.” However, the undeniably aesthetic appeal of quiet that is less than 10% of open circuit divers is of considerable potential value to any diver in addition to the increased ability to interact with wild live. In 1989, the term “dive computers” was first coined to describe expensive and exotic devices that were known by no less than 27 different names. Less than ten years later, the term was common place and the majority of divers dove with one. I will be surprised if another ten years go by before the same cannot be said of the expensive and exotic devices known as … rebreathers, and for recreational divers, rebreathers similar to the Hollis Explorer have the potential to be the standard for the future. 1This article is an updated version of an original article by the author that appeared in the magazine Discover Diving in February 1997. Ahhh, the thought of buried treasure!! I would be willing to bet that if I were to interview a thousand divers, at least one or two became involved in diving because of some story they had once heard about finding buried treasure! I remember one such story being Peter Benchley’s, “The Deep,” in which they describe the famed “Three Lock Box.” Such a box was kept for only the most important items and required three separate keys, maintained by three separate individuals, to be opened. This insured that the property owner would receive the property to which he or she was entitled. In comparison, a “three lock box” can also be an effective metaphor for dive preparation. So often when thinking of dive preparation, the diver may limit his or her self to pre-dive gear packing and the planning discussion that goes on during the ride to the dive site. However, if someone is to be truly prepared, there is much to do long before the day of the dive. In fact, when examining preparation, there seems to be three clear keys to Effective Preparation for Every Dive. From a personal perspective, the first key has to be mental preparation. Preparation of this type extends far beyond using a computer to pre-plan your time at depth 50 minutes from now, and requires some steps to effectively get there. For example, the diver must recognize his or her own capabilities. Is the dive being considered within the realm of the diver’s training? Is the site a new site or one dove many times in the past? Does one have all of the appropriate skills, tools, and techniques to complete the dive safely? Participants in some activities are encouraged to visualize, a process of mentally walking through the event, attempting to identify possible challenges or areas where an incident may occur. The night before a dive, visualization can help one determine choices for gear while packing. On the ride to the site, visualization allows the diver to prepare more directly, while witnessing environmental issues that will likely affect the dive. Without this kind of mental preparation, a diver cannot just say they are ready to dive on any given day. Few people look forward to loading and unloading heavy gear. Hauling tanks back and forth from a dive vessel, or climbing back on board a boat using a dive ladder can require a lot of effort, making physical preparation the second key. While much of that preparation should occur months and weeks before a dive, through exercise, skills practice, and healthy habits, it continues right up to the day of the dive. Frequently, a dive actually begins with a drive to the departure location, either the morning of or the night before. Eating a healthy meal, hydrating effectively, and arriving well-rested are all part of physical preparation. The fact is, staying up until 2 am the night before drinking beers with friends might seem like a great start to a weekend, but not to a weekend of diving. Knowing such activities lead to the increasing probability of DCS incidents, it just doesn’t make sense. Knowing there is another diver, who may depend on his or her buddy, makes it even more important to be able to perform at optimum levels. Obviously, gear preparation is something that cannot be overlooked and it is our third key. Scuba diving is called a gear intensive sport for a reason. The fact is people do not have gills, and if we are to enjoy what the marine environment has to offer, then equipping ourselves to exist in that environment is important. Annual maintenance is vital to safe diving, if only to insure the life support equipment is performing to standard. Trying to verify gear functionality on the way to a dive site however, is not preparation. Many find it effective to “flat diver” the gear before packing. Essentially, one would lay everything out and make sure that everything needed for the day’s dive is ready. In contrast, the only way to verify regulator and buoyancy compensator functionality is to assemble and test each delivery and exhaust point. Batteries and bulbs need to be fresh in lights and computers. Surface marker buoys and lift bags should be clean and ready to deploy. Finally, is the “Save-a-Dive” kit adequate to actually save the dive? Will the spare mask and fin straps work properly with the gear being packed? While “plan the dive, dive the plan” has been a part of the diver mantra since the early days, it is important to note that such planning begins long before the day of the dive. Effective mental preparation, through training, research, and visualization are all key components. Physical preparation with effective exercise and living habits are also key. Finally, equipment preparation, not only in maintenance of equipment but in its proper selection for its anticipated use, is the final key. Only with all three keys, can we effectively unlock the “three lock box” of dive planning. Only at this point can the diver effectively determine the goals, depth, and duration for the dive. Even the seemingly simple tasks of entry and exit need to be planned. Finally, never forget the post dive plan! It would be a shame to go through all of that preparation and planning, failing to include a stop at the local tiki hut for a meal, libations, the telling of lies, and sharing of discoveries!! Rob Bradish, who refers to himself as “a recreational diver with technical Interests”, has been diving since 1981, crossing over to “the Dark Side” as an instructor with SDI/TDI. He works as an independent contractor through Air Hogs Scuba, of Garner, North Carolina and Blackbeard Scuba of Southport, North Carolina. War is one of mankind’s greatest failings and perhaps one of the greatest instigators of invention. In war men fight. Ships sink. When men learned how to extend their time underwater to salvage sunken vessels it was their nature to consider the concept of an underwater warrior. Those soldiers would have to be comfortable in most any condition of water. They would have to be able to swim great distances and still have the strength and stamina to carry out their mission and still escape unharmed. They would need specialized breathing equipment that would allow them to breathe underwater. In order for the apparatus to allow for long range penetration of enemy held areas, it had to reuse the exhaled breath of the diver while preventing exhaust bubbles from escaping and giving away the position of the diver. It had to offer extended time underwater, be light weight, versatile and dependable. It had to be a rebreather. 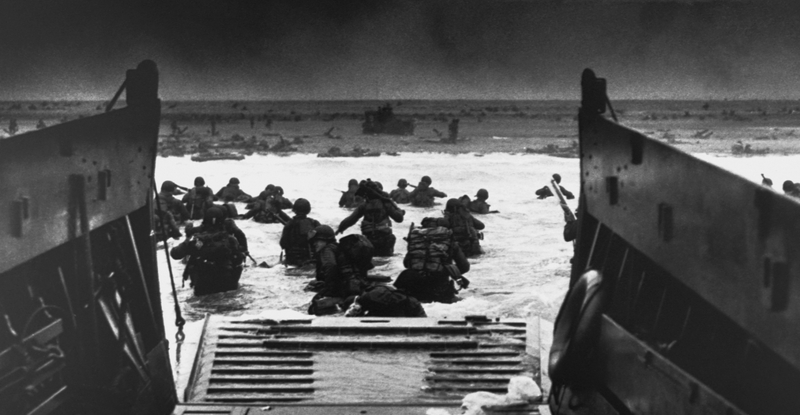 On the morning of June 6, 1944, Operation Overlord commenced. It was an event like none other and was divided into many parts, each of which had to work with the others to be successful. It was also the beginning of Operation Neptune and began the invasion of France at Normandy. It was D-Day. It was the largest amphibious invasion in world history. Those landing from water were to land on one of five beaches code named Utah, Omaha, Gold, Juno and Sword. The hard thing about such an invasion is that it is hard to hide. When those occupying the land do not wish to be invaded, they resist. Fortifications, hedgehogs, steel and concrete spikes, some steel tetrahedral, mines and other hazards had been placed on the beaches and in the water. Guns were placed on heavily fortified bunkers perched on the hillsides. Fortified machine gun nests had overlapping fields of fire. And the guns of Pointe Du Hoc could rain down hell on both Utah and Omaha beaches and sink vessels at sea 15 miles out. Before the landing craft could land the fortifications blocking their way had to be destroyed. Naval demolition teams were responsible for those obstacles underwater and the Army engineers above water. But plans never quite work out the way they are supposed to. The weather changed. Conditions worsened but once started Operation Overlord could not stop. The degrading weather cost them time and high tide was missed. Because the tide was out when the demolition teams made it to their objectives, most of the obstacles were out of the water. The naval group took those seaward while the army teams placed explosives on those closer to land. On D-Day, they were not all referred to as frogmen. Those from the Royal Navy were Landing Craft Obstruction Clearance Units. More commonly called Lockyews. The ‘LCOCUs’ were a vital part of the D-Day invasion forces in Normandy. Four Royal Navy and six Royal Marines units comprising 120 divers wore newly developed neoprene suits with ‘blast proof’ kapok jackets underneath, helmets, breathing apparatus and fins.They laid the foundations for the Very Shallow Water (VSW) and beach clearance techniques in use today.Those remaining after the war were eventually incorporated into the Clearance Diving Branch. A RN demolitions team was working Gold beach. When they arrived, they found that the obstacles they were to clear were underwater. Each of the hedgehogs they were to clear had to have 36 small charges placed at strategic positions so that the steel would blow into pieces with none more than 18 inches above the bottom. Each of these obstacles was covered with pressure sensitive explosives designed to punch holes in water craft. “We must have been about four hundred yards from the beach when the firing first started, and they didn’t forget to inform us that they knew we were coming. When we finally got on the beach we discovered that we were being systematically sniped, not only with rifles but also by odd bursts of machine-gun fire – a most unpleasant experience”. Dennis Shryock was 21 years old when he landed on Utah Beach. Dennis had been trained as an explosives specialist and one of those elite men who were the forerunners of our modern day Navy Seals. The machinegun fire was deadly. They did not have the protection of being underwater and had to wade to each of the obstructions to place explosives. He said the water “looked like pure blood.” But they did the job. According to navy statistics, at Utah, the demolition teams lost six men and had eleven wounded. Omaha beach did not fare as well. They lost thirty-one and another sixty were wounded. The water was rough from the stormy wind and the unexpected rain soaked equipment that was intended to remain dry. It took the landing craft longer to reach the beaches than expected. The plan was to hit the beaches at high tide; for the troops to be able to take shelter in the bomb craters as they made their way up the beaches. But they missed high tide. Most of the obstacles placed to keep the landing craft away were on dry land. When they were able to land, the troops had to run through wet sand 300 to 500 yards just to get to the bomb craters. Landing craft that had been fortified with bullet proof plating caused the crafts to ride much lower in the water. Too many of them were swamped and sunk before they could reach shore. The majority of the soldiers on board, weighted by 70 pound of equipment, drowned. Those that survived had to face a wall of bullets and artillery shells. The guns at Pointe Du Hoc had to be taken. The 2nd Ranger Battalion had trained hard in preparation for this day. They had practiced climbing cliffs and had brought along firefighting ladders and rocket propelled grappling hooks to help make the 100 foot climb. But it had rained.The ropes were wet and the propellant used was calculated with dry rope. The ladders were hard to foot and difficult to climb. German machinegun fire was held to a minimum by sharpshooters on the ground but they could not stop them from dropping hand grenades in an effort to keep them from climbing. The 2nd Ranger Battalion clawed their way to the top using footholds in the mud and rocks and bayonets driven into the cliff side when necessary. It took them twenty minutes to make the climb and take the Pointe. They held it for two more days before reinforcements reached them. Of the 200 men that started, only 90 were left in fighting condition. What exactly was the breathing apparatus used by the USN frogmen and the Royal Navy Landing Craft Obstruction Clearance Units? It was able to supply an extended amount of breathing gas underwater by reusing the exhaled breathe of the diver. It did not allow exhaust bubbles to escape and was stealthy. It was lightweight and maneuverable. It was a rebreather. While only remotely similar to rebreather units today, the ones used in 1944 were many generations of development old. In fact, the Italians started the concept of underwater assault teams using specialized equipment. And they recognized the need as early as World War 1. In 1918 two members of the Regia Marina (Royal Navy) literally rode a torpedo into a harbor and sank an enemy ship. At the time, they had no breathing equipment and had to guide the torpedo at the surface in order to breath. They sank the ship but were captured when they tried to swim away. These human torpedoes became more like mini submarines and were human guided. Obviously the ability to be under the water, able to breath and stay stealthy was an advantage. By 1941 the Italian navy had both a surface unit that operated fast, explosive motor boats and a subsurface unit that used manned torpedoes. Within this group they also had assault swimmers. It did not take long before other countries developed their own versions. The idea of an underwater warrior is older than modern history. The functional ability to use such a warrior has always been limited by the inability to breath underwater. Throughout history, man has found ways to extend his time underwater and by the turn of the 20th century, some of the first closed circuit rebreather systems had been experimented with and used. The rebreather units used on D-Day were rudimentary compared to the modern versions we see today. But at the time, they did the job and those who used them had to be beyond courageous. On June 6, 1944 those underwater warriors had a mission to do and short of being killed or captured, that is what they did. Mark Phillips is a retired 33 year career firefighter and Public Safety Diver; A Master Scuba Instructor an ERDI trainer, and Publisher of PSDiver Monthly, an Internet magazine dedicated to advancing the safety and knowledge of the Underwater Investigator. Being new to the tech diving world, the thought of diving a rebreather seemed very challenging. After diving open circuit for almost 4 years I did not have any idea what to expect. From all the standpoints I had heard, rebreather diving seemed very complex and hard to do, but TDI and Hollis made it a very simple process for me. The Explorer is a pretty simple machine and in my opinion, the electronics are easier than most open circuit sport diving computers. The Explorer breathes almost as easy as a conventional open circuit regulator. Another one of the highlights of the Explorer is, it’s great for photographers, and anyone who likes to get close to the critters. Since there are few bubbles exhausted during the dive, it doesn’t scare away the marine life, and makes it very pleasant for reefs full of aquatic life. As far as training goes, there really isn’t THAT much more to learn than open circuit, and if you have an instructor that is as good as Peter Friedman, then training should be a breeze. The Explorer is very simple, and is a perfect stepping stone for anyone who wants to get started in the tech diving world. I would recommend at least trying the system to everyone, as long as you can follow the rules and pay attention to your electronics. I really hope to further continue my rebreather experience. One day I would like to transition to diving the Hollis Prism2, a Closed Circuit Rebreather (CCR), but I cannot stress enough the importance of proper pre-dive procedures and good judgment when diving any rebreather.